Today I’m welcoming Victor Hugo to my series of author interviews. Victor is the French author, playwright and poet of many works, such as the plays Hernani and Ruy Blas, the novels, Les Misérables and Notre Dame de Paris (sometimes called The Hunchback of Notre Dame), and many collections of poetry, including Feuilles d’automne, Châtiments and des Contemplations. Victor: Thank you for having me. Elizabeth: Your novel, Les Misérables, was converted more than twenty-five years ago into a very successful musical play and most recently into a movie. What do you think of these adaptations? Victor: It’s an honor for my work to be sought out in this way. I feel that Les Misérables is one of my greatest achievements and for it to be brought to new generations is rewarding. I think it might have been more effective, though, if it had been done as a serious play. As many of your readers may know, I don’t care for music as an art form. Making my characters sing and dance creates an aura of superficiality and flightiness, making it seem as though these events could never have happened in real life, which is disappointing. It lessens the message of the novel. Elizabeth: Did you realize that many who view the play Les Mis believe the stand at the barricades was a part of the French revolution? Victor: Is this true? Pathetic. Those who cannot remember the past are condemned to repeat it. But don’t quote ME on this. I’m not really the one who said it. Elizabeth: Which authors do you see as having influenced your writing? Victor: Goethe is the first name that comes to mind. He revolutionized what it meant to be a writer; he understood the depth of ideas and emotion that could be transferred through a written work. Who else? I’m quoted as saying, at age fourteen, “I must be Chateaubriand or nobody,” although I don’t remember saying it. I met Chateaubriand once. He was a belittling, arrogant man. Elizabeth: You’ve written plays, poetry, novels and essays. Is there a format you prefer? Victor: Not really. Each has a distinct purpose. A writer should know his purpose before writing and then choose the format that will help him accomplish it. A play has an immediacy not found in other genres; it creates a community of the audience who can be moved all together. A novel can create a depth of emotion difficult to sustain in other formats, and its ability to thoroughly express and share complicated ideas is unparalleled. I find, in my old age, that poetry most suits me now. I’m more reflective than I was in my youth, and I don’t feel the need to make grand, passionate statements that move a people to action. Through poetry I can thank God and my family for what I have and what I’ve learned about live. Hopefully others can read my poems and glean some small wisdom. Elizabeth: If I may, I’d like to ask you some questions about your daughter. Victor: Yes, of course. Léopoldine was perfection. I think I always recognized her as an angel, but I didn’t realize her time with us would be so short. I never fully recovered from her death. Elizabeth: I didn’t mean Léopoldine. I want to ask you about Adèle. Victor: Coffee. Tea is for wimpy Englishmen. Victor: Hiking. I’m always telling my wife and daughters that they shop too much. Victor: Fantasy. This may surprise you, but I wish that I’d written the Lord of the Rings. Perhaps in another life I am J.R.R. Tolkien. Elizabeth: Hester Prynne or Scarlet O’Hara? Victor: In real life, the love scene; I’m working to avoid the death scene. I’d like to thank Victor Hugo for joining me today. 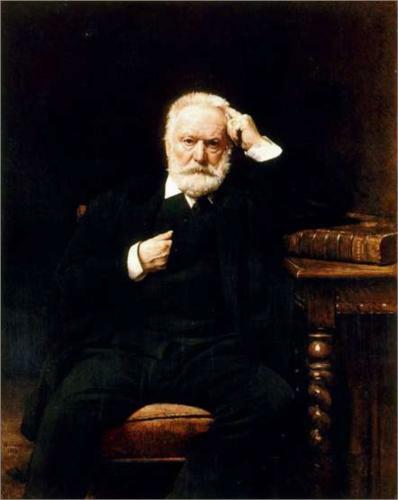 Victor Hugo died on May 23, 1885. This isn’t a real interview: it is an April Fools’ Day interview! Thanks for playing along. I hope you enjoyed meeting my Victor Hugo character. Although this interview was a piece of historical fiction, Victor did indeed write the books, plays and poems named above. He was the father of four children, all but one of whom he outlived. His “crazy” daughter Adèle stars in my novel, Syncopation. I’ve been studying Victor Hugo and his work for several decades, and so for many of his answers I allowed myself to “channel” his thoughts. If you want accurate information about Victor Hugo, I suggest going somewhere more credible than a blog! I recommend: Johanna Richardson’s Victor Hugo, published by St. Martin’s Press in 1976. Leslie Smith Dow’s Adèle Hugo La Misérable published by Goose Lane Editions in 1993. My favorite quick source for all things French is my Petit Larousee Illustré, 1987. Thanks for joining me today and have a Happy April Fools’ Day!